And after fours of build-up, preparation, qualification - and a couple of hours of racing - the fifth edition of the Olympic Games Triathlon is now a thing of history. Two great races, two incredible champions and lots of history made. 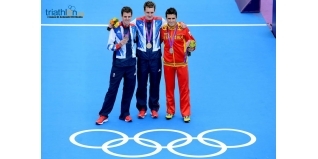 The first successful defence of Olympic Gold by Alistair Brownlee. The first double medallist in the women's race courtesy of Nicola Spirig. Lots more. Here are ten images from the Olympic Triathlon podiums from Sydny 2000 to Rio 2016. Great Britain's first ever triathlon medals in the men's race, plus the closest ever finish in the women's. Jan Frodeno (GER) caused an upset - and has since added further to his legend status. Emma Snowsill (AUS) lived up to her position as the overwhelming pre-race favourite. Jan and Emma have sinced married! A big day for New Zealand with Gold and Silver from Hamish Carter and Bevan Docherty. Kate Allen (AUT) stunned everyone with a sensational run split to take Gold by seven seconds from Loretta Harrop (AUS). Triathlon's big debut on the Olympic stage couldn't have been bigger - first medal, first morning and Sydney Opera House as the backdrop. Brigitte McMahon (SUI) spoiled the party by beating Australia's Michellie Jones. Great Britain's Simon Lessing was the hot favourite for the men's Gold, but as he finished ninth, Canada's Simon Whitfield won the biggest prize in sport.